"Get Your Work as Vertical as Possible!" The title of this was the advice of my chiropractor about six years ago. My upper back, left shoulder and neck were in constant pain. 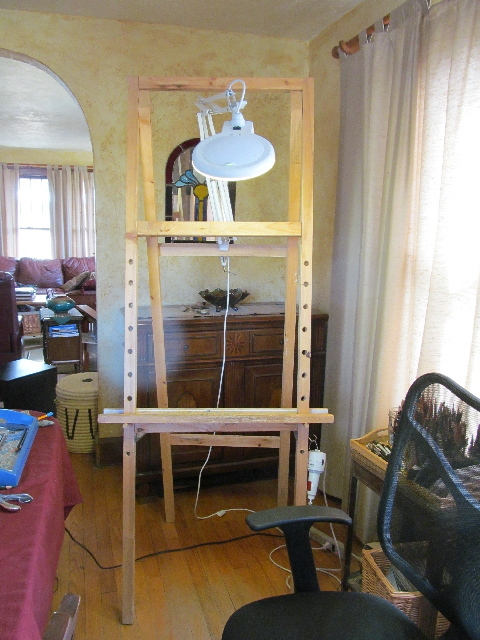 I started by using a tripod easel with an adjustable horizontal tray. This worked well for years then I needed to create some bigger (colored pencil) paintings that needed to be able to slide up and down on my easel. As I used to be an Architect I drew up some rough plans of what I wanted and my husband built it for me. 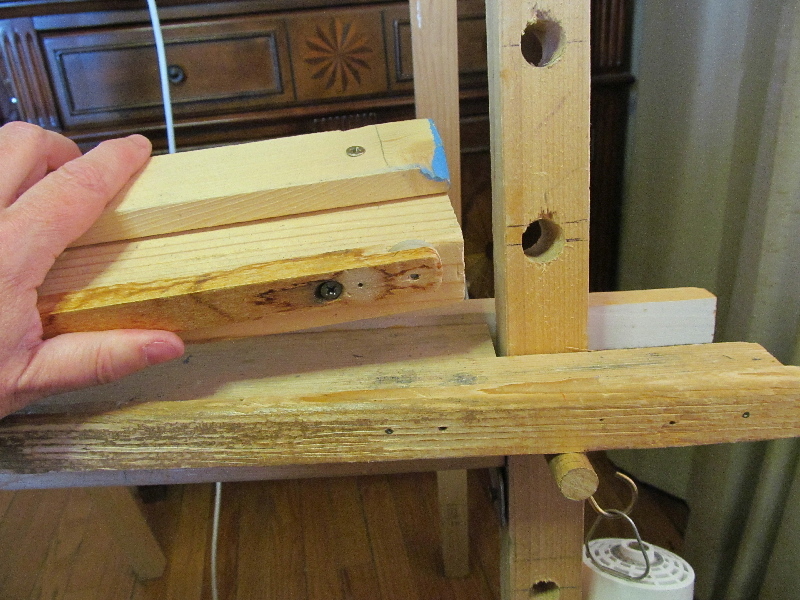 I didn't want a smooth well finished easel, I wanted a work horse. So for Christmas a few years ago I got my easel with Christmas lights strung on it. I love it! It is rough and rustic and is starting to show wear but it works well. Here is a picture from the front without the drawing board sitting on the tray. When we first designed it, my light fit on the top. However my new light scraped the ceiling so we added another board on the back to compensate for it. The tray sits on pegs that fit into holes. This lets me adjust the height that the painting sits at. I left enough room under to role my chair in and out. Another change after it was built was that I needed it to go a little lower so we drilled two more holes below the horizontal post and I put the tray in from below or just rest my big board on the pegs. I don't use this often but it is nice to be able to when I need to. 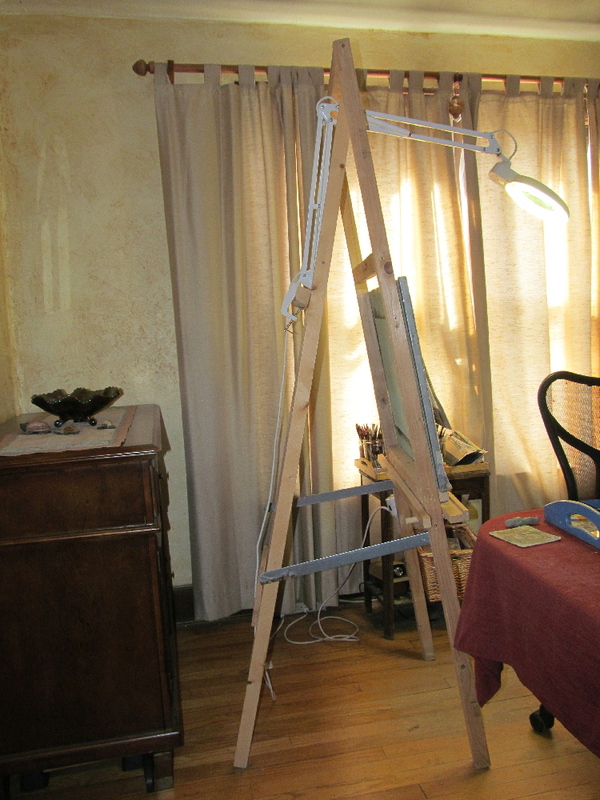 The width of this easel is 25" and the height is 74". Here is a detail of the moveable tray, the pegs and the holes. I used a cup hook to hold my electric eraser from my old architecture days. After using my new easel I realized that I wanted it to rise and fall in smaller increments and I didn't want more holes in it, so we created a half space bar for that purpose. It fits in the tray and has a lip on the front and back to hold the board. The height from the floor to the bottom hole is 24". The holes are spaced 3" apart. My easel is very crude but, I didn't care and we had no idea so many people would want to see it. 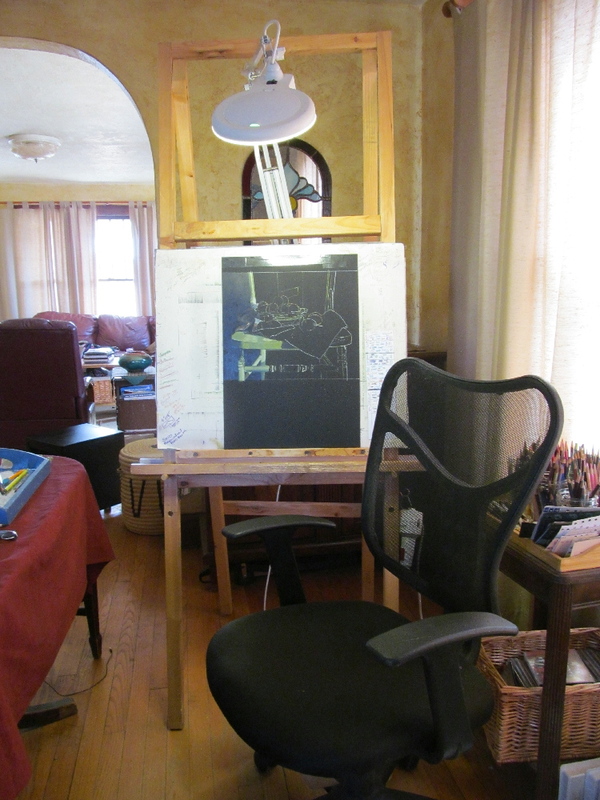 Here is the front with my small drafting board and a work in process. My larger board is about three feet square. 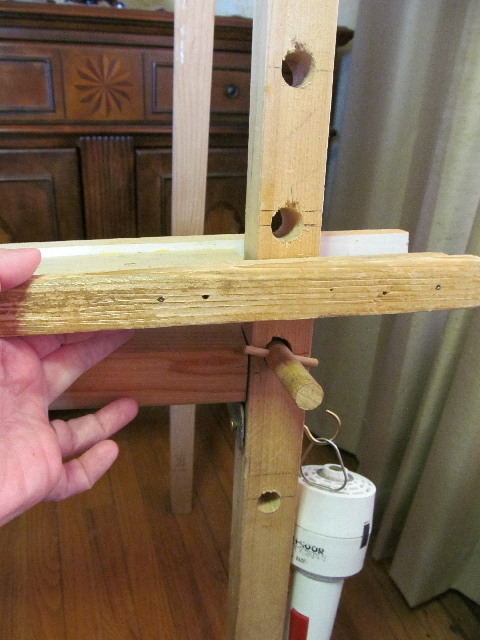 Here is the side of the Easel. The metal piece holds it in place and then lifts in the back in case I want to fold it up and put it in the closet for company. This is my dining room so the easel is moved out from time to time. I really like this space and will continue to keep it here. You can also see the handle of my cutting board under the buffet. Hope this is helpful. Well, back to the drawing board.